I have been away for 3 weeks from my blog. Well, was busy on the workfront as well as on personal matters. Travelled home to India to be with the family. Spent some brief but quality time with the family who were keen to light one more candle on the cake. 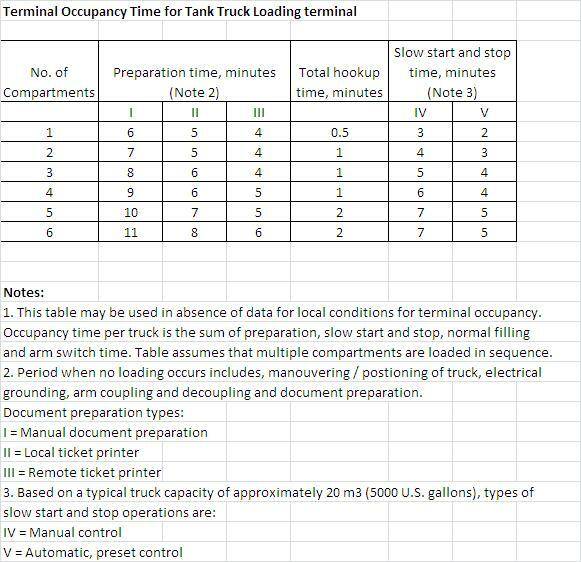 Today's blog entry deals with design guidelines for tank truck loading terminals for petroleum products. Notable exclusions from these design guidelines are LP Gases & Cryogenic Liquids. b. Seasonal Variations: These can be significant for certain products such as motor gasoline, heating oils, fuel oils, asphalts etc. f. Select the highest number of spots resulting from the controlling case above rounded off to the nearest whole number. The aforementioned write-up tries to provide general guidelines on how to design a tank truck loading terminal. However, to repeat, these are very general guidelines and process engineers involved in design of tank truck loading terminals should follow the specific project requirements when provided to them as a design basis or concept for a given system. Hope all of you enjoy this blog entry and looking forward to comments and discussion on this topic from knowledgeable members of the community. thank you for the post Mr. Ankur, I find its interesting. It was much informative. I don't know if my comment would form part of scope for this article but would like to post it as extension to the same subject. Normally it is seen that at truck, ship loading and unloading terminals or say bulk plants, the time is of utmost imporatance. This is directly proportioal to how fast the tanker can be loaded or unloaded. Secondly, its also important to unload complete volume present in tanker or even strip out the reservoir/bulk tank to maximum which depende upon NPSH for pump being used. The result could be the truck/tanker/tank can not be unloaded completely or vice versa. Many times, the bulk plants/storage tanks are been elevated from ground to meet such NPSH requirments. While working with various process technologies, I came across PD pump applications, especially screw type pumps. Using 3 screw pump, or 2 screw pump found to be much efficient w.r.t. pump efficiency as well as complete loading/unloading of oil/fluid. The NPSH requirments of these pumps is very low. The capital cost can be high, but Total cost of Ownershop ( TCO) if run over say 5 years can be way lower than equivalent centrifugal pump. Its therefore important to select right technology for right product and application. I believe PD pump, 3 screw is the best choice as far as we are dealing with clean fluid. 2-screw pump can also be used for same application based on fluid properties. I hope this would be useful. I can provide more educational info on screw pumps as its seen as not properly noted technology by design engineers, rotating equipment engineers. When it comes to basic technology selection, we directly go for API-610 as gross criteria for oil & gas application. However API 676 screw pumps can be more efficient compared to centrifugal one for such applications. Please feel free to add/edit as per need.